Percussionist and electronic performing artist Josh Bess is the author of Electronic Dance Music Grooves: Techno, Trance, Hip-Hop, Dubstep, and More! , just published by Hal Leonard Books. In the video, Bess takes us behind the scenes as he creates drum grooves! Electronic Dance Music Grooves provides creative insights to help you understand how to build exciting, powerful, and compelling EDM grooves. Whether you’re into techno, trance, dub-step, drum ‘n’ bass, garage, trap, or hip-hop, author, Ableton Live Certified Trainer, and noted EDM performer Josh Bess helps you take your skills to the next level with an extremely efficient and intelligent groove-making system. And, as an added bonus–providing a valuable basis for your own creations–this book describes the history behind the development of multiple electronic music styles. A MIDI map, designed to make it simple to use the included grooves and samples with virtually any modern DAW, accompanies each styles. Whether your preferred DAW is Ableton Live, Reason, Pro Tools, Logic, or almost any of the other popular music production and performance software applications, you’ll quickly be equipped to incorporate these grooves and samples into your own creative workflow. Electronic Dance Music Grooves includes over 300 professional-quality drum and FX samples, more than 300 drum grooves and MIDI files, 17 Ableton Live Drum Racks, and much more, all provided to support your creativity and electronic dance music production. Samples and sessions are delivered online to ensure access to all content, whether you’re using a desktop, laptop, or mobile device. Explore Electronic Dance Music Grooves with Josh Bess! 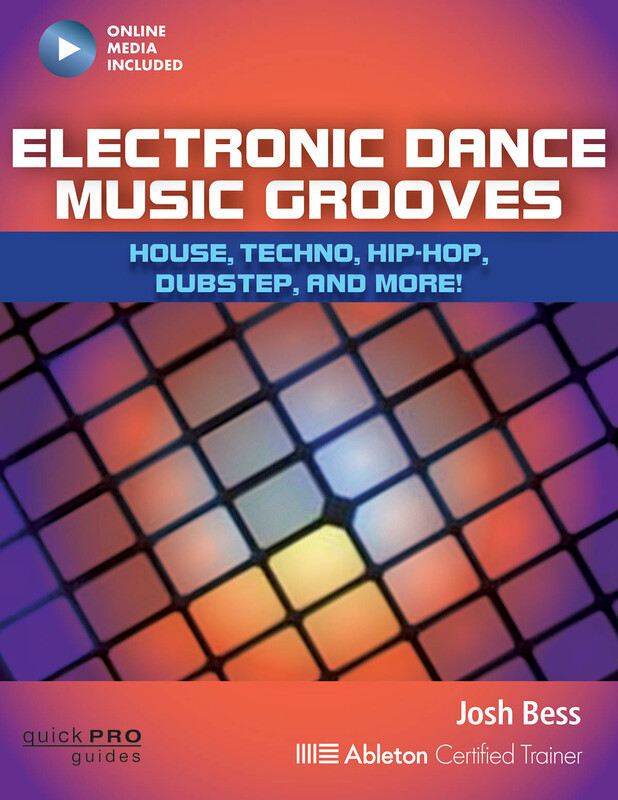 Hal Leonard Books has published Electronic Dance Music Grooves: House, Techno, Hip-Hip, Dubstep, and More!, Josh Bess’s guide to building exciting, powerful, and compelling EDM grooves. Josh introduces his book below, and provides audio content examples at his website, www.joshbess.net. Check it out!! Electronic Dance Music Grooves is a book designed to help anybody and everybody learn to program a wide variety of electronic dance music drum grooves with the use of MIDI programming. It will help somebody starting out from the most basic levels all the way to advanced producers, musicians, and programmers. Electronic Dance Music Grooves teaches you more than mapping out beats and grooves; it will hopefully become a stepping-stone to a new way of thinking and creating. The main purpose behind Electronic Dance Music Grooves is to introduce new styles of music and grooves that you have possibly never played, programmed, or even heard of before, along with tips and tricks to create something new for yourself. Throughout the book, you will easily see how powerful and important a drum groove is to music styleidentity. Understanding what creates a specific genre’s groove, from the rhythm and dynamics to the choices of individual sounds, plays a huge role in identifying a tune’s style and genre. As there are currently thousands of electronic music subgenres, rather than covering each and every style there is, we’ll cover the main foundational styles of Electronic Dance Music, which have stemmed to create new styles, subgenres, and categories. With the grooves learned throughout this book, you will gain the necessary understanding, techniques, and knowledge to create the rhythmic structure and patterns for any of your favorite electronic music styles. Former product and support manager for the music industry (including Antares Audio Technologies, the makers of Auto-Tune) Max Mobley uses a conversational style without cutting corners on key technical terms and concepts. Make the transition to Studio One with incredible speed and ease! Montclair, NJ (February 16, 2013) – Hal Leonard Books, the musician’s best source of books on the music business, audio technology, instrument history, and more, is now shipping Studio One for Engineers and Producers. Studio One for Engineers and Producers starts by relating Studio One’s layout and functionality to other common DAWs, to identify the most important similarities and differences. It then follows the creative process through the normal progression of a modern recording/production. This new cross-platform (Mac/PC) DAW is built from the ground up for speed, efficiency, and power; Studio One for Engineers and Producers is the perfect tool to shorten the pathway from installation to inspiration!